A year later, I continue to write, and Trump remains in power. As a high school social studies teacher, this year-long journey has brought both continuity and change. On Tuesday, January 30, 2018, President Trump made his first State of the Union Address to the American public. I chose to read his speech instead of listening to the president’s delivery or viewing his appearance. I have often analyzed presidential statements in this way, and I think the method helps me to internalize the message without as much emotional influence. So, what is the state of our union? As a public school teacher, I would welcome more funding and more programs for vocational education and apprenticeship opportunities. I am married to an automotive technician–he can attest to the need for young people to enter the trades. We also own an automotive repair shop, and the pool of candidates for hire is slim. So, Mr. President, bring on more career opportunities for my high school students! No, the real reasons that public education, the bedrock of American democracy, was not on the forefront of the President’s agenda is because there have been very few victories for students, teachers and the schools they serve in the first year of President Trump’s power. 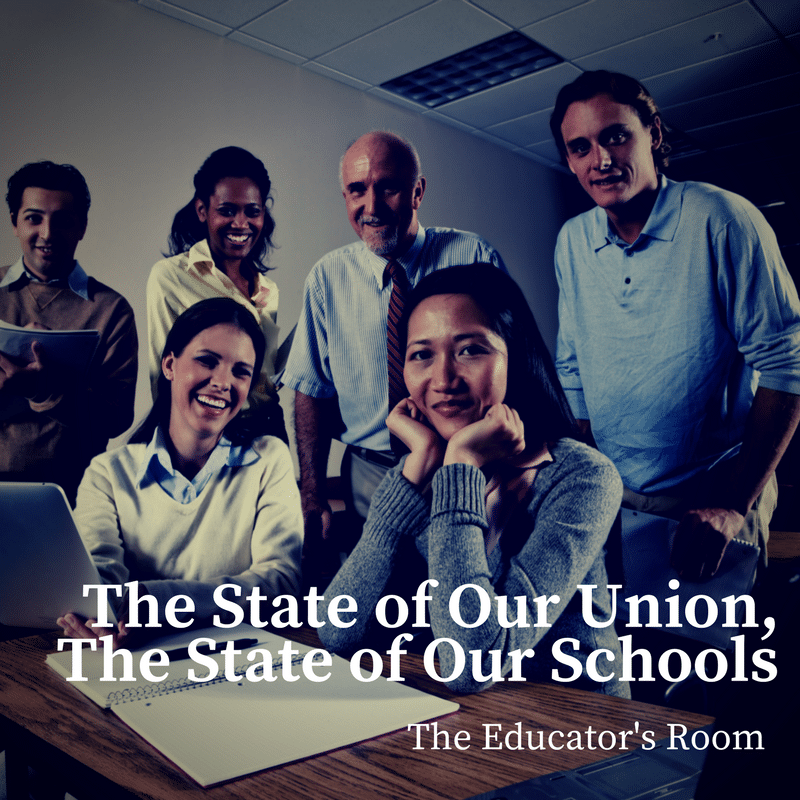 Please allow me to highlight five reasons public education was mostly absent from President Trump’s State of the Union Address and why the state of our schools is the best indicator of the state of the union. Trump told the American people that we would win so much when he became president that we would be sick of winning. If the current state of public school funding is any indication, ain’t nobody winning. Just look at the recent classroom conditions in the Baltimore Public Schools, where students were compelled to wear hats, coats, and mittens while trying to learn. Of course, most of those freezing students were brown, so maybe Trump did not mean that all Americans would be winners. No, he probably meant to say that winners look like him, you know he is a genius. The Republican tax plan has plenty of losers, including public school funding — especially in states where public education is well-funded: New York, California, and Massachusettes. No, the “Tax Cuts and Jobs Acts,” will not support public education. One of the most damning provisions is that property taxes are capped at $10,000 for a federal deduction. In states like New York, where I teach, it is not uncommon for suburban property owners to be very close to this amount. What will happen when taxes are inevitably increased, and the federal subsidy is gone? Will these “blue” states continue to support public education, or will these taxpayers with already heavy burdens want to vote with their feet, demanding school choice? When divestment in public schools begins, it opens the floodgates for privateers to make a profit off our children. 2. 529 Plans Are No Longer Benign. My two daughters have about $10,000 allocated in an NY Saves 529 college saving plan. This modest sum will probably not buy them that much higher education, but it is an attractive plan for middle-class Americans. Now, under the new tax plan, I can use that money to fund my daughter’s private school tuition. If private schools in my area offered a better education than their current rural public school, would I be tempted to utilize the 529 differently? 529 plans, once a tool for parents and grandparents to shelter some funds for higher education, are now a tool of school privatization. The ed-choice movement has a new way to fund their institutions. This move has the potential to increase the disparity in educational experiences of all Americans, as well as expand segregation, and continue to separate marginalized communities. Authorities have frequently questioned science. Galileo’s nine-year house arrest in the 17th Century is a prime example of censorship and denial of reason. In a time of technology, why would students challenge science? The answer partly lies in the country’s leadership: The Trump administration appointed, Scott Pruitt, a climate change denier, as the head of the Environmental Protection Agency. January 2018 New York State Global History and Geography Regents Exam. 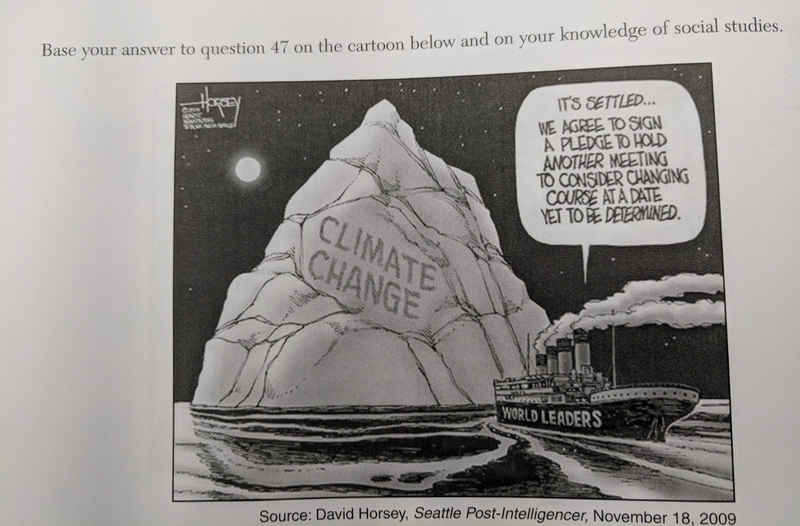 Climate change is a topic in many disciplines. Trump’s policies are shaping classroom discussions. Students are observing adults questioning science in the age of Trump. 4.Racism, Sexism, and Xenophobia are student’s current events lessons. Charlottesville, VA is probably a beautiful place that I have yet to have the privilege of visiting, but the name Charlottesville resonates with the same meaning as Selma, Montgomery, and Little Rock. Racism, resistance, slavery, oppression, hate, and discrimination forever tied to those cities. As a white educator I never truly appreciated the Black Lives Matter movement until Charlottesville. Sure, I sympathized. I am a historian who recognizes both the negative and positive of our country. Charlottesville: where white men in khakis lit Tiki torches and ran over a counter-protester. Racism is alive in the United States, and the president of the free world declared that there were some good people among the demonstrators. Racism is emboldened and sanctioned in the time of Trump. #MeToo. Yup. And, a president of the United States was elected after he said that he “can” grab women by their genitalia just because he is famous. Yes, he said it as a younger man, over ten years before he was a presidential candidate. Why does the duration between the utterance of words and attainment of power matter? So when women wearing pink hats march (twice) resisting the pervasive climate of predatory men clinging to power, students are noticing. Young women of today understand. My sophomore female students fully appreciate the leer, the comments said under the breath of a few of their male counterparts. My daughter gets it and has already told me seventh-grade boys have publically critiqued her changing physique. “You’ve Come Along Way, Baby” was only a slogan to give women cancer. Sexism is real, and so are women’s’ collective voices. Students are watching the current debate closely. Many are wondering if their generation will inherit unresolved immigration issues. 5. Teacher Activism is Growing. Teachers are organizing because they recognize that political change is educational justice. There is intense intersectionality between the support of public education and the myriad issues that encompass human rights. Moreover, there is a consensus among educators that President Trump’s appointment of Secretary of Education, Betsy DeVos was a colossal blunder. On July 22, 2017, my youngest daughter and I marched in the streets of Washington D.C. yelling slogans about school funding and support for public institutions. She made her sign, which read: “Tests the politicians, not kids.” As the march began, her nose started to bleed. Seeing the crowd leaving the shadow of the Washington Monument heading toward the U.S. Department of Education, my daughter handed me her sign so that she could hold the wad of gauze the EMT provided. She marched the entire route with a bloody nose. What a trooper. As I looked down at her small, blonde head, I knew why I traveled to the protest: to save the best of what is America, public schools. Teachers are getting loud. We are addressing the persistent inequalities in school funding, teacher salaries, and opportunities for our students. If President Trump had highlighted a public school educator, I would have liked to see Ms. Deyshia Hargrave, that brave middle school teacher from Louisiana who took a stand in that recent Vermillion Parish School Board of Education meeting. While the State of the Union Address might have been upbeat and an attempt at bipartisanship, I wonder if under President Trump we can foster prosperity without xenophobia? Can we have jobs without hate? Furthermore, there are over 50 million future voters enrolled in public schools across the nation. In every unheated, crowded classroom led by underpaid professionals, these young citizens see the state of our union and they recognize what the adults value.